Pierce Brosnan always carried an Omega Seamaster in his four movies as secret agent James Bond. In the movies Tomorrow Never Dies, The World Is Not Enough and Die Another Day the modelnumber is 2531.80.00: a blue bezel, steel bracelet Seamaster Professional Chronometer. The Seamaster watches in these three movies come equipped with options as detachable detonators, a laser that cuts through steel, or a 50 foot high tensile micro filament, able to support 800 pounds. In GoldenEye, the first of Pierce Brosnan's appearances as 007, he wears a blue Seamaster, model number 2541.80.00, the Seamaster Quartz Professional. In Casino Royale, when Daniel Craig takes over the role of Bond, the Seamaster 2531.80.00 was replaced with a Seamaster 2220.80.00 and a Seamaster Planet Ocean Big Size 2900.50.91 with rubber strap. 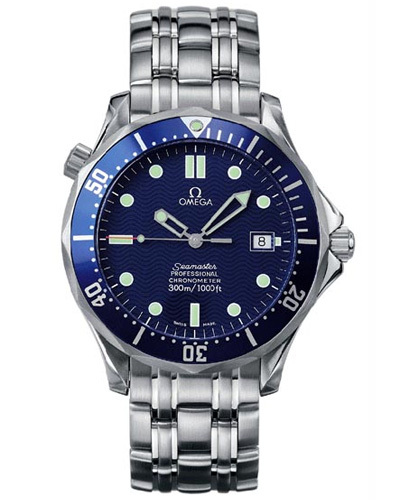 Brosnan's Seamaster is not available anymore except on the second hand market, but the successor (the 2220.80).